We've been winning awards again! Last week, we joined the likes of Mica Paris and Twiggy at a glitzy awards ceremony to receive 2 top tourism awards for the Best London for Free Experience and the Best Family Fun. We won both these prestigious Evening Standard People's Choice awards, which form part of the BT Visit London Awards, for the second year in a row. The ceremony took place at the theatrical Bloomsbury Big Top (shown below) on 8 December to celebrate the best of tourism in the capital. The event was hosted by TV presenter Neil Fox. Olympic gold-winner Dame Kelly Holmes presented the Outstanding Achievement Award to winner, Twiggy. 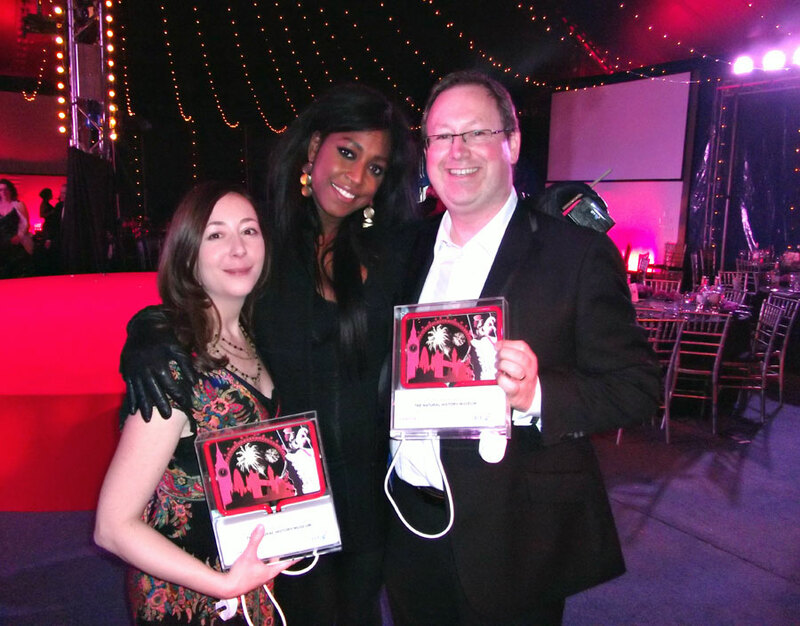 Our head of Visitor Services Sandy Clark and Head of the Formal Learning team Aby Tinkler - pictured here with Mica Paris who performed on the night - were there to accept the awards. "For me the People's Choice awards gives approval from our visitors to what we do and how we do it, and that is something that all of us in our industry aim for. "Winning these awards was made all the more rewarding and humbling because we up against such a high calibre of attractions. "The whole of the Natural History Museum team should be congratulated for all their hard work in making the Museum such a popular and exciting place to both work and visit." It's been a great year for the Museum's visitors with a record number of more than 4.5 million people enjoying our galleries so we must be doing something right. The week before, the Museum hosted this year's Green Awards ceremony where it was announced that the UN's 2010 International Year of Biodiversity campaign had won the Best Green International Campaign Award. Over 450 organisations including the Natural History Museum are part of the IYB-UK partnership, so this was another honour for us.